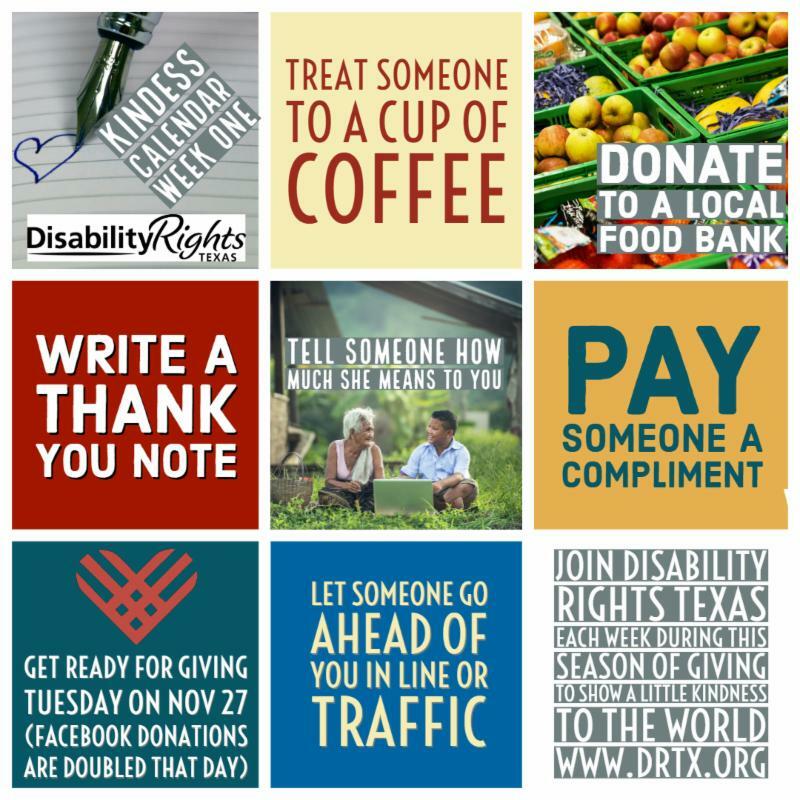 Subscribe to news and information from Disability Rights Texas . We've been seeing ads for Black Friday deals for weeks ahead of time. But here's one deal that you (and we) can't afford to miss out on. When you give to us through our Facebook page on Giving Tuesday , November 27, Facebook and PayPal will match your donation! You can make a donation and/or create a fundraiser on that day to share with your friends. If you give $40, we get $80! If you raise $200, we get $400! Matching starts at 7:00 am and is for THAT DAY ONLY. I n celebration of World Kindness Day, and in preparation for Giving Tuesday and the giving season, join us in spreading some much-needed good will. Each week for the next month we will send you one of our kindness calendars that offer some simple ideas for giving back and getting in the holiday spirit. Treat someone to a cup of coffee. Tell someone how much she means to you. Get ready for Giving Tuesday on Nov. 27 (Facebook donations are doubled that day). Can't call during our regular intake hours or can't get through due to high call volume? Click here to complete our online intake form available 24 hours a day, 7 days a week.